Height-adjustable bariatric cane is specially designed to evenly distribute weight for maximum comfort, control and safety. 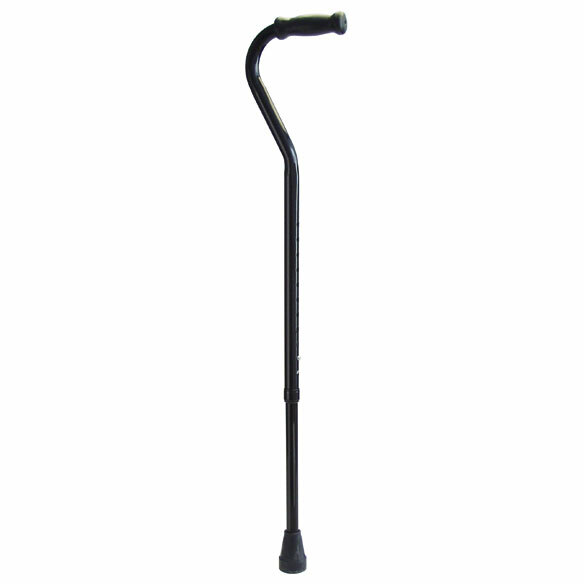 This walking cane's offset handle with molded, non-slip grip places the user’s weight directly over the base. Heavy-duty steel construction supports up to 500 lbs. Easy push-button height adjustment from 29”–38”. Black 7/8" dia. shaft resists scratching and marring. 2”dia. non-slip rubber tip is ideal for any surface. Adjustable cane contains natural rubber latex. the wait limit is very high. It is time for me to get a new cane so I ordered this one. My wooden cane needs a break from constant use. This is only place that has a walking cane for large people.Most canes are rated for 250lbs, This cane is rated to 600lbs. Made of steel not light alumiinium .I am 6 ft 3in. tall this cane adjust to 38in. My husband has used one of these in physical therapy recently and wants/needs one for home/personal use. It's solid. the folding ones scare me a little. How I order replacement cane tips for this bariatric cane? BEST ANSWER: Thank you for your question. We do not sell exact cane tips for this cane but cane tips are sold that should fit this. We hope this information will be of help to you. I'm inquiring about the bariatric cane for $39.99 that supports up to 600 lbs. What brand is it? How much does it weigh? BEST ANSWER: Thank you for your question. We are not able to share vendor information The cane tip weights .22 lbs. We hope this information will be of help to you.